Rather then buying, often high priced, floor cleaners at the store; make your own. 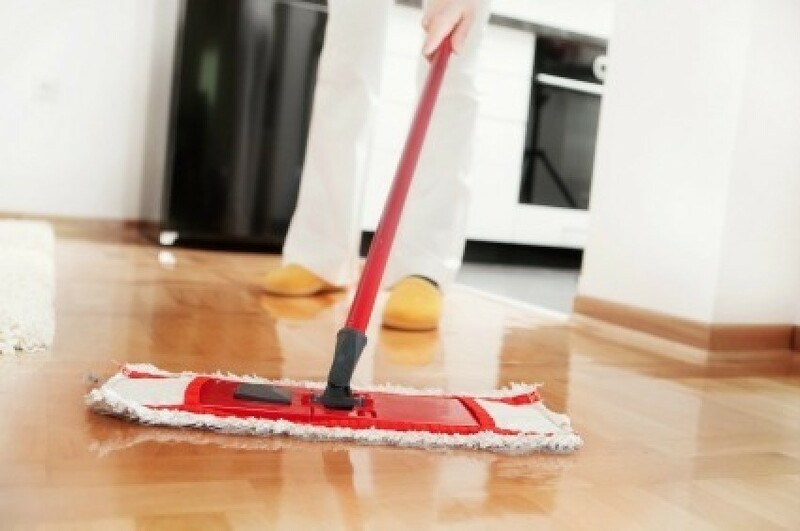 This page contains homemade floor cleaner recipes. The best way to clean your laminate floors without leaving a hazy film behind is simple, cheap and you can make it yourself! Mix together the alcohol and water, half of each. If you want to add soap, add VERY little (1 drop of Dawn or 1 scant teaspoon of Dr. Bronner's). If you want to add essential oils for scent, just add a few drops. Pour into a spray bottle. Spray onto floor VERY lightly, working in small sections, and wipe immediately with a soft cloth. I like to have 2 cloths, wipe first with one, and then the other so the second one stays pretty dry. The alcohol cleans, yet evaporates quickly, which helps to stop any filmy residue from building up. This is also why you use VERY little soap. Try it with no soap first. If your floors don't need the extra boost, you can leave the soap out. Most important is to make sure you spray, wipe and dry, very quickly. You don't want to leave laminate floor wet for any time. Pour 2 gallons of warm water into your bucket. Add 1/4 cup of white vinegar, 1 Tbsp. dish soap, and 1/4 cup of washing soda. Mix well. Go ahead and clean your floors. This works well, but not on waxed floors. In my house we have ceramic tile with little grooves in it. That's the best way I can describe it. Is there a recipe for a homemade floor cleaner? My pediatrican told me not to use PineSol or Lysol. They contain harmful ingredients that could hurt my baby. So, I don't know what to do. The lady at the local health food store today told me she uses vinegar and baking soda on her hardware floors. I just want so want something that is safe for my kids. My son is crawling and walking, but likes stuff. Weird, kid-like I know. I need to figure out a good glass cleaner, too. Any suggestions? I bought Tea Tree Oil and Orange Essential Oil. Get a floor steamer and add a little peroxide directly to floor (not in steamer), and clean away. White vinegar and water for both the floors and windows and for everything else including toilets too! Of course you'll only need to pour maybe a half a cup of vinegar in the toilet since there's already water in it ;-) LOL! For cleaning that needs a paste just mix baking soda and water, rinse and then disinfect with vinegar and water. I also purchase vinegar by the gallon like kellk does and it lasts a really long time and costs just pennies on the dollar compared to all the chemical cleaners out there! Just don't mix vinegar and baking soda together, as vinegar is an acid, and baking soda a base, and they will neutralize each other, so you will have salt water. They will bubble together, but that is just releasing carbon dioxide. Entertaining, but no cleaning value. What is a good homemade recipe for Vinyl floor cleaner? You can just use ammonia and add some water per the instructions on the container. If your floor are really dirty don't water it down too much. It works great! This recipe works best on Pergo laminate floors, vinyl, or linoleum. Just place the mixture into a spray bottle and spray onto the floor and use a high quality microfiber mop to mop it up. If you get a sticky residue, try using less dish soap. You can also rinse with water to reduce the residue.